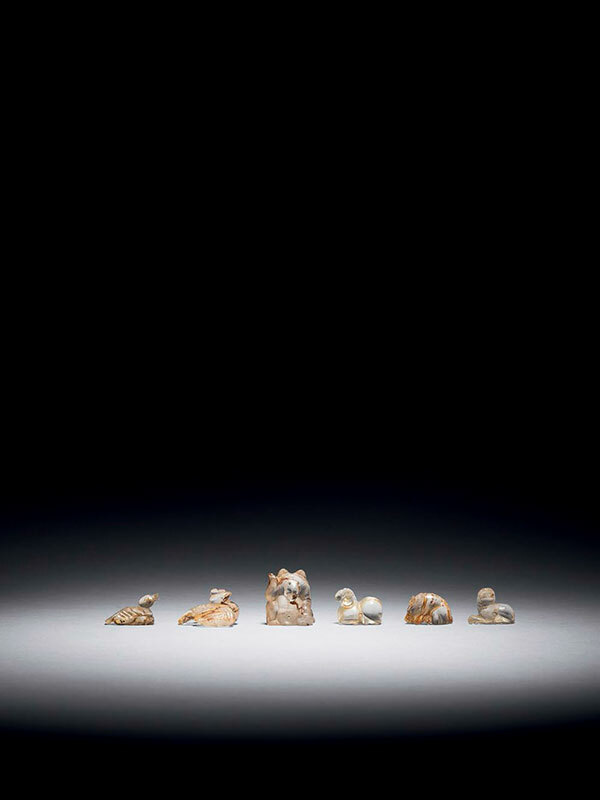 A group of six miniature animals carved from rock crystal, comprising a duck, a ram, a lion, a phoenix with outstretched wings and two bears, respectively in seated and recumbent postures. The animals are realistically carved and each is drilled through. On all animals the clear crystal has some rust markings, presumably due to them having been buried in close proximity to metal objects. The rock crystal used to carve these charming miniature animals is very fine, pure and colourless, a typical characteristic of the high quality stone found during this period . Rock crystal is traditionally valued for its translucent quality as asymbol of purity, and is referred to as shuijing, literally meaning ‘water essence’. The use of small, carved objects such as these was popular from the Western Han dynasty (206 BC – 9 AD) onwards, mainly serving a personal ornamental purpose for necklaces or bracelets. Two comparable rock crystal miniature rams form part of a necklace that was excavated from a Western Han dynasty tomb at Huchang, Yangzhou, Jiansu province, and is now in the collection of the Yangzhou Municipal Museum. Examples of closely comparable miniature rock crystal animals of a ram, a bear and a phoenix are in the Liu Family collection. Two slightly larger Western Han dynasty jade carvings of a bear and a hawk, comparable in design, were excavated from the Weiling Mausoleum, Xiayang, Shaanxi province, and are now in the Xianyang Museum.